At one time I thought sleeping in a backyard tent (within walking distance of my home) filled with nine first grade girls would be the most ridiculous event I would ever chaperone, but that was before I was put in charge of a group of kids during Emma's fifth grade over night outdoor education field trip. During the course of our stay, we were taken on a survival walk where mother nature's angel of death brought us into the middle of a forest and kept telling all these happy wide eyed city kids that if they go into the woods they'll be lucky to get out a alive. Suddenly I found myself whispering things to children like, "No, sweetheart, we are not really going to die; we are just on hike and it isn't very likely we are going to need to build a fire with rocks for distilling drinking water to prevent our horrific dehydration. Isn't this fun?" Later we dined on corn dogs, baked beans, and canned peas and I noticed our table faced a lovely horse alphabet poster; just picture a horse contorting itself to look like a "V" and you'll understand why we lost our limited appetite for corn dogs to laughter. Oh and there were team building games for the kids, too! You know, the really fun kind where you have to move a group of people from one side of a field to another (in the rain), but you can only be carried and carry someone once? Inevitably the game ended with the largest girl needing a lift from the smallest boy in the world. Much awkwardness ensued and the next thing you know three Moms were calling out to the rangers, "Um you know what? This game is over." and "Yep, I think we've reached the point where we are seriously done building this team." and "I am kind of questioning the productivity of this exercise." To top it off, all of the girls and their chaperones slept in one giant room on bunk beds with broken springs in the mattresses and we'd all had beans for dinner. For some reason the teachers thought the program had gone downhill since the previous year and decided to make different plans going forward, but that trip was honestly one of the most hilarious experiences of my life! Now that Finn is ready for his turn roughing it, we thought it might be best for Dad to get in on the overnight field trip action this time around! Leif jumped at the chance, took a little time off work and headed to the Indiana Dunes this morning with Finn and the rest of the fifth graders. I had heard the trip has vastly improved since Emma went and the rumors must be true because they seem like they are having the time of their lives! Today they all did a little cross country skiing while learning about the winter adaptions of plants and animals in the dunes. 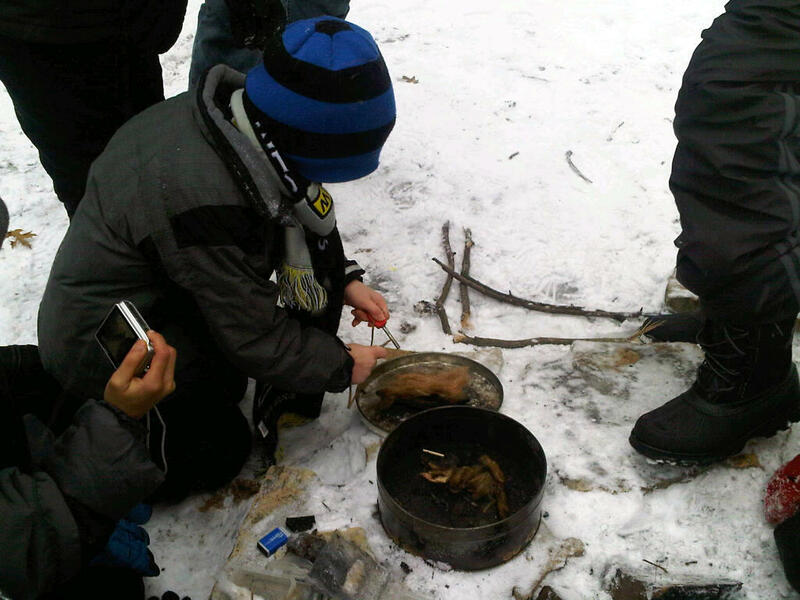 Leif even emailed me this picture of Finn starting a fire with a flint. 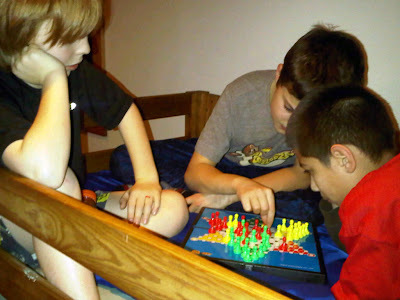 They had spaghetti for dinner and played a little Chinese Checkers in their cabin before hitting the sack! Doesn't that sound amazing? I bet they'll have as much fun tomorrow! this does not ring a bell with me. Pretty cool, how long do they stay? They are gone for two nights! The program at the dunes is really amazing and Leif texted me that everyone is having an outstanding time! How fun! I can't wait to hear all about it! I remember that field trip...the best part was when the parent chaperones played cards!